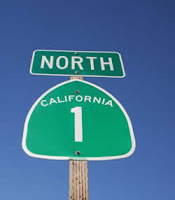 We began our Highway 1 adventure (or California Highway 1/Pacific Coast Highway as it’s more formally known) at its southern end, about 60 miles south of Los Angeles near the city of San Clemente. 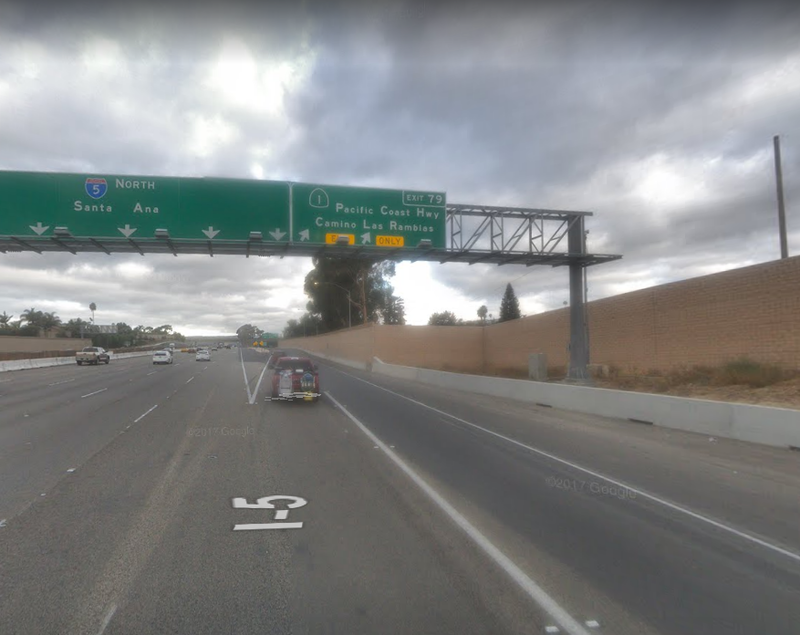 Here, Highway 1 cleaves off from the multi-lane I-5 Freeway and heads back towards the coast and heads north through some well-known communities such as Laguna Beach, Newport Beach, Long Beach and Redondo Beach. Along the way, we passed several spectacular stretches of white sand and azure blue water. It was tempting to stop and enjoy this stunning setting but parking was expensive and difficult to find. 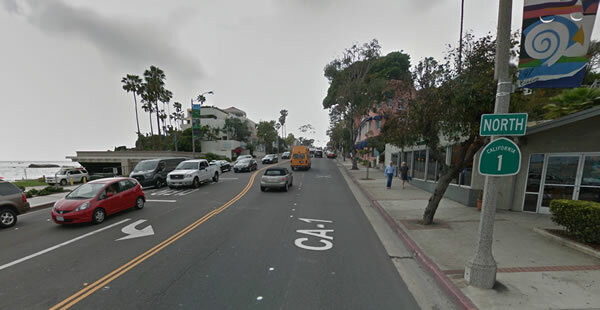 A little past the community of Hermosa Beach, Highway 1 left the coast and disappeared into the urban wilds of Los Angeles, following various surface streets and boulevards as it crossed America's second largest city. Driving this part of the route could have easily consumed a half-day or more and was anything but scenic. Having learned this lesson the hard way on a previous trip, we hopped on I-405 and were across town in less than an hour. 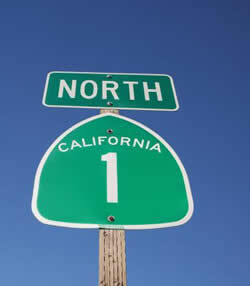 Eventually, we rejoined Highway 1 near the community of Santa Monica, known for its beaches and pier. Right next door was Beverley Hills and West Hollywood as Maureen and I discovered while looking for a gas station. We also discovered that when driving down streets like Wilshire Boulevard or Rodeo Drive, a truck and travel trailer drew far more attention than a limo or luxury car. Perhaps RV’s were a rarity in Tinsel Town. Past Santa Monica lay the city of Malibu and more beautiful beaches. Malibu was also our destination for the night. Camping spots and RV parks in this area were few and far between, especially near the water. A couple of state parks in the vicinity offered some camping opportunities but spaces large enough for a big rig were scarce so we opted for a private campground - the Malibu Beach RV Park. Despite the name, the park was not located on or near the beach. Instead, it sat atop a hill that provided a spectacular view of the beach, ocean and surrounding area. The view however, came at a cost. Sites ranged from $70.00 a night to more than $200.00. While the camp amenities such as a pool, store, games area, etc., were nice enough, the sites themselves were on the small side and composed of compact sand. When the winds blew, it was like a scene from a desert movie. Past Malibu, the highway continued to hug the shoreline for several more miles before taking its leave and accenting up into the hills. Views were still great but often obscured by trees. As well, the highway contracted from the four lanes we had enjoyed since San Clemente down to two and would remain that way for most of its remaining length, expanding to four lanes on occasion when near urban centers. 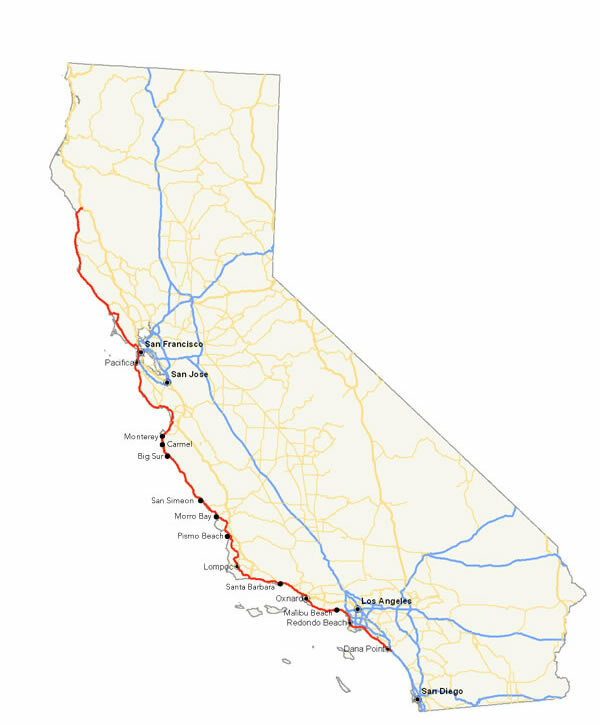 From Malibu all the way up to San Simeon, about 200 miles to the north, the highway seemed to play tag with the shoreline, embracing the coast near communities like Ventura and Santa Barbara then cutting inland through locales such as Oxnard, Lompoc and San Luis Obispo. Inland or ocean side, there was still a lot to see and do. We could have easily spent several days exploring the city of Santa Barbara. And then, there were all the neighbouring communities, attractions and beaches, not to mention the rich agricultural areas and numerous wineries a short distance inland. 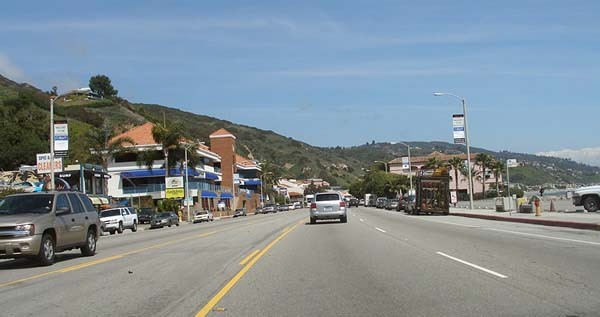 Continuing north, we reached our next overnight destination, the community of Pismo Beach, about 100 miles north of Santa Barbara. In a region blessed with countless beautiful beaches, Pismo Beach stood out. With miles of gorgeous white sand, gentle waves and a gradual slope, this seashore had it all. So too did our camping spot - the Pismo Coast Village RV Resort. 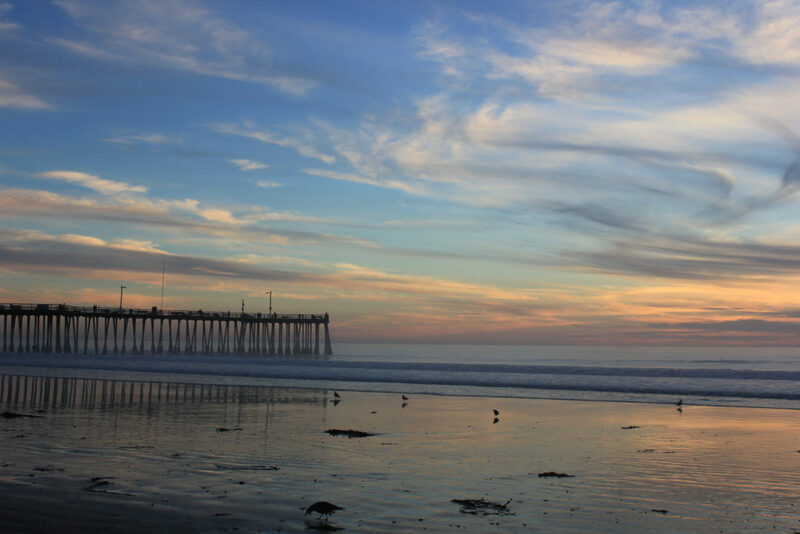 This award-winning destination was right on the water, just steps away from both the beach and the downtown Pismo Beach yet rates were still reasonable (given location and time of year), ranging from $50 to $70 a night. Regardless, the opportunity to walk hand in hand along this splendid stretch of sand at sunset was priceless. 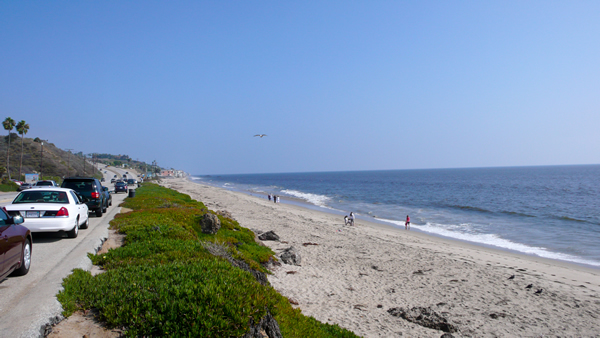 With a beach this lovely, it came as no surprise that the town’s main focus was tourism. Almost every business and enterprise seemed dedicated to serving visitors’ needs. And, even though it was mid-October, there was no shortage of visitors seeking services. 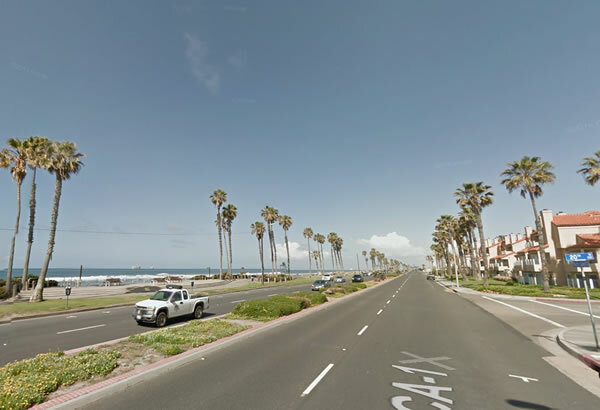 While Pismo Beach definitely had a tourist vibe, just up the road was an entirely different community. The town of Morro Bay was (IMHO) an undiscovered gem, with a more genuine, less glitzy feel. Protected from the open ocean by a long sand spit anchored at the north end by Morro Rock, Morro Bay is one of the few communities along the central coast with a sheltered harbor. Once a thriving fishing center, the harbor now held as many pleasure craft as fish boats. The protected waters were also home to an amazing amount of wildlife. Sea otters, harbor seals, sea lions, mammoth elephant seals and numerous shore birds all enjoyed this calm, sheltered inlet. A half hour further north was the hamlet of San Simeon, near the site of the famous Hearst Mansion and Point Piedras Blancas beach. The beach was home to huge population of elephant seals. Depending on the time of year, it was possible to see hundreds of these huge creatures lying about on the beach, mating, breeding or just hanging out. Calling them “huge” was no exaggeration. A typical adult male weighted more than 3 tons! A walkway above the beach provided visitors with excellent views without disturbing any of the “residents” and volunteers were available to answer questions. Beyond San Simeon, the landscape became quite deserted. Other than the small community of Big Sur, about 150 miles to the north, there were few homes, buildings or settlements along this part of the route. As one guidebook recommended, if you have to “go” (as in, use a washroom), do it before leaving San Simeon. Afterwards, facilities were few and far between. The same was true for fuel. While there were a couple of service stations along the way, their prices tended to be $2 - $3 per gallon above the going rate. Past San Simeon, Highway 1 became quite winding as it twisted and turned to follow the contours of the hills, valleys and shoreline of the rugged central coast. 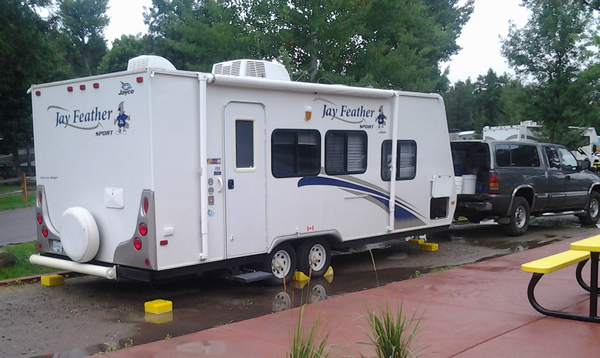 Driving an RV was definitely more challenge but not unreasonably so as long as reasonable care and caution were exercised. If traffic backed up behind us, there were plenty of places to pull off and lots of superb scenery worth pulling off for. The rugged landscape, rocky shoreline, pristine beaches, mist-shrouded coastline, pounding surf and untouched wilderness created a breath-taking panorama. With scenery this spectacular, why rush? As evening approached, we looked for a place to stop. With no private RV parks and few state parks and campgrounds in the area, locating a place for the night could have been a challenge. We were lucky enough to find a spot at Kirk Creek campgrounds, about half-way between San Simeon and Big Sur. Situated on a small peninsula about 100 feet above the shoreline, it offered no services but a fantastic view of the ocean. As Maureen and I sat at our picnic table, saluting the setting sun with a glass of wine, the $30.00 a night camping fee seemed like an incredible bargain. In the next episode, Maureen and I continue our journey north along Highway 1 visiting romantic Carmel By The Sea and prestigious Pebble Beach then on through downtown San Francisco before experiencing some heart-stopping moments as we continued following Highway 1 along the north coast of California.